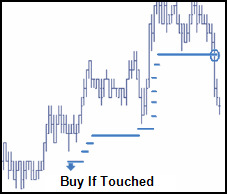 Buy Trailing If Touched orders are placed below the current market. As the market rises, the trigger adjusts so that it is never more than a specified number of ticks away from the market price. If the market falls, the trigger price does not adjust..
Sell Trailing If Touched orders are placed above the current market. As the market falls, the trigger adjusts so that it is never more than a specified number of ticks away from the market price. If the market rises, the trigger price does not adjust. The following is an example of a Trailing If Touched in the Order Pane where the trigger price dynamically adjusts so that it is three ticks away from last traded price. Once triggered, the Synthetic SE submits a child order priced relative to the Ask price minus one. The TTStatus field displays the Trailing If Touched order in Pending Triggerstatus. During this time, the Synthetic SE continuously monitors the order and dynamically re-prices the trigger price. The quantity displays in the Undisclosed Qty column because it is not actually included in the exposed depth of the market. Select Trailing If Touched from the Modifiers list. Create an Order Template with Trailing If Touched order parameters using the Order Defaults window. From MD Trader, select the Trailing If Touched order configuration. Select the Trailing If Touched configuration in the Order Type drop-down list. Note: A red a circle with a slash through it appears if you try to enter an invalid price level.